Innovation is the word on everyone's lips. Yet even organisations with great creative capacity often find it difficult to sustain new ventures in the face of traditional hierarchies that are resistant to change. And for the many companies concerned about their future survival in a rapidly changing marketplace, innovation is a Holy Grail that cannot be obtained by mandate or implementation of controls. Drawing on his many years' experience as a business leader and advisor in a highly competitive field, Gerard Fairtlough shares his insights into how best to encourage and nurture innovation within an organisation by implementing policies of trust, openness, focus and accountability.His wisdoms are informed by an examination of existing theoretical models of innovation. 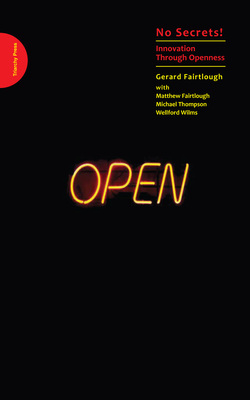 Gerard Fairtlough died suddenly in 2007. No Secrets! is his final work and is presented as a dialogue with contributions from his friends and colleagues in organisational thinking, including eminent cultural anthropologist Michael Thompson and Wellford Wilms. For senior managers interested in changing the way their organisation works, this is an eye-opening guide to hierarchy, heterarchy and responsible autonomy. For academics, researchers and MBA students, it has become required reading.